As a relocation professional, i was selected by my employer, Palladium to intern with IKAN Relocation India, Delhi office for two weeks. I share my absolutelty amazing, once in a life time cultural and work experiences below. Hope you all enjoy reading them as much as i loved writing them. Even though about 80% of my clients are Indians, I had not been aware of this common principle that Indian people generally follow when hosting guests. But as soon as I stepped out of Indira Gandhi International Airport at around 2 a.m. after my arrival in Delhi, I would get a first hand experience of this principle. I got picked up by poor Rohan and Yadav, who did not get a lot of sleep that night, as well as the guard that we had to wake up when we arrived at my accommodation at about 3 a.m. And yet I had the feeling of being absolutely welcome and taken good care of from the very beginning of my stay in Delhi – a feeling that did not go away for the rest of it. My first weekend I was showed around some special places by Sumana, Rachna, Rohit and Rohan, who all went out of their ways to make me feel comfortable and safe in this chaotic, vibrant city. Being used to the cleanliness and order of my home town Munich, I did not know where to rest my eyes on first and how to process all of these new impressions. But sooner than I had thought I started to calm down by just watching my Indian companions’ behavior very closely and trying to assimilate. Having only met Rohit in a private atmosphere at lunch the weekend before, my first workday showed me a whole new side of him – his role as my new boss at IKAN Relocations. Being excited to meet my new Indian colleagues for the first time, I immediately felt most welcome and some nice and interesting conversations started to unfold. Rohit himself gave me a thorough and very impressive introduction to IKAN’s history as well as their unique systems (i-Track, i-Navigate and i-Tour) that made me realize how many great software features are out there. On the other hand, I was astonished to see the amount of tracking every IKAN employee has to do for every single step they accomplish during a client’s relocation process. At my company we have a very different but a lot less time-consuming way of tracking all important or potentially critical actions, only by saving every important e-mail in our system, Relotracker, by way of BCCing them. Personally, I would probably feel too constrained and monitored in my own work if I had to track every single one of my actions. But I guess that’s just a matter of everyone’s personal way of working and also habituation. After work, Rachna and Rohan were so kind as to take me to New Friends Colony Market for a variety of authentic food from different parts of India. As a vegetarian, I really loved the food, even though I did not know what exactly I was eating – I trusted Rachna and Rohan on their food choices and was not disappointed. Tuesday was a very exciting day for me. Anuroop took me on a whole-day home finding trip with a client couple from Canada (wife) and Italy (husband). Since I work for the immigration team at my normal job, I had never been on a home finding trip before so I was just as excited as the clients and I was amazed to be in a car with four people from three other countries. At any point of our trip I had the feeling that the clients felt the same amount of hospitality I have been greeted with and that Anuroop was listening very closely to their wishes, fears and demands. 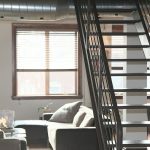 Back in Munich I would definitely like to go on a home finding trip with one of our consultants so I’ll be able to compare my experiences and put them into perspective. On Wednesday, I joined my new colleague Rohan to visit some potential clients that all had a connection to Germany in some way. We visited the Indo-German Chamber of Commerce, the German School that is run by the German Embassy as well as Max Mueller Bhavan, a Germany language school in Delhi. Unfortunately, we did not have fixed appointments with any of the above so we were asked to just contact them again to schedule meetings with the responsible person. I was asked to try to set up a meeting with the German Head of Administration to introduce IKAN’s services, but sadly one day later she called to let me know that the school was not interested in working with external relocation companies like IKAN. My frustration was eased by my colleagues as well as Rohit, who all told me it was not the end of the world. Thursday was the day on which I learned about the Indian side of the immigration process that I usually manage for my clients who come to live and work in Germany. Vinod, the Immigration Service Director gave me a very insightful presentation and FAQ-sheet that taught me all important steps of the immigration process to India (during the pre-arrival, post-arrival, on-going as well as departure stage). I was surprised to see that the immigration process did not seem to differ too much from the German one, except for the very important fact that it is now possible to file most applications online in India instead of having to visit the town hall or immigration office in person, unlike in Germany. One can say that India really is at least one step ahead in terms of online services that make a lot of administration tasks so much easier for everyone involved. Having said that, the other side of the Indian administration system was presented to me on Thursday when I joined Rohan and an Indian client to have his university degree legalized for his upcoming job in Dubai. Not only was I shocked to see the state the administration office’s building was in (a former school as far as I could tell) and the high population of pigeons that were living in that building, I also got a firsthand experience of the clerk asking to be handed about 15,000 INR to finish the legalization process on the same day instead of 15 days. Definitely one thing that I would never encounter at a German authority office where incorruptibility and neutrality of the officers are a golden rule respected by all participants. Friday marked the beginning of my very promising career as India’s new movie superstar. A film crew visited the IKAN office to shoot some new scenes for their corporate movie to be published on their website. It was so exciting to see how movie shootings are done and I was relieved to be the first one to do their part. But when the director told me I had to say all of my lines by memory, my heart dropped to the ground and I already said Goodbye to my career in Bollywood. After about 15 minutes I was done and the director told me I had done a great job. Part of my video will be on the corporate movie and part of it will be shown at the annual EuRA conference in Munich in May – maybe another chance to start my international movie career? However, I was really happy and proud to be part in IKAN’s movie and also share my experiences with all the people who will watch it online and at the EuRA conference. 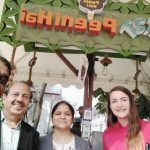 In the evening, Rohit and Sumana invited me and about ten more colleagues, friends and clients to an amazing bar in Gurgaon called Whisky Samba. 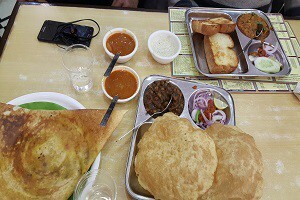 The food and drinks were fantastic and I got to see a whole other side of India – a young party crowd who is looking to have some fun on Friday night, just like me and my friends would back home. When I leaned back in my chair to take a sip of my wine and look at my company I realized that it must have been one of the most interesting dinner parties I have ever been invited to and I will never forget that special evening. I had some time to relax on Saturday, so I decided to go to the nearest supermarket to shop some snacks and tea to bring back home to Germany. It looked like the supermarket was still located within my neighborhood, Kalindi Colony, but when the Google Maps directions took me out of the colony I started to feel a little uncomfortable. Until that moment I had always been accompanied by some Indian colleagues, so being a non-Indian unaccompanied woman in an unknown area outside of my colony sure got me some strange looks by the locals who did not know what to make of my appearance. Of course I made it home safely, but I certainly think it would take some time for me to walk around Delhi all by myself without any worries. Even though many friends back home had warned me that people would give me strange looks in the streets, I had definitely not expected to be the only non-Indian person in Delhi most of the time. However, I can understand that many locals are bewildered and intrigued by that strange European woman roaming their streets and tasting their delicious local food. The other side of this is the phenomenon of Indian strangers asking me to take a selfie with them, which has happened about five times so far. That certainly made me feel like a celebrity here in India! 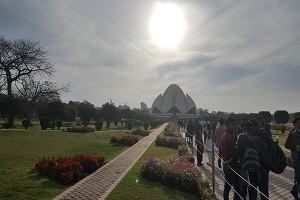 My dear colleague Rachna took me out to the amazing Lotus Temple as well as some nice market Saturday afternoon, where she again insisted on paying for my meals. When I protested, she told me about the Hindi saying about guests being Gods, so I surrendered, once again puzzled by the sheer amount of kindness and hospitality that I have been greeted with. Even though I had to get up at 5 a.m. on Sunday, it marked one of the highlights of my stay in India. 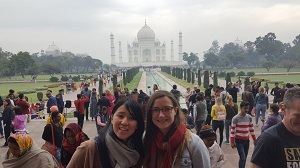 My Japanese colleague Mai, a Japanese client and I were taken to the famous Taj Mahal, one of the seven Wonders of the World that I had always wanted to see. The sight of it was breathtaking and will definitely be one of my favorite memories of my stay in India. We visited the Red Fort in Agra afterwards, which was also a very beautiful place to see. The only thing that sort of lowered our pleasure during this trip was the vast amount of vendors trying to sell us souvenirs in a very aggressive way in that they would even run after us without accepting our unwillingness to buy any of their goods. While it breaks my heart to ignore every Indian child that begs for money or food, I know that it would only attract a much bigger group of children if I gave something to just one of them. The same holds true for all the stray dogs that I saw just lying around in the streets every day, but I know I can’t take all of them back home with me (unfortunately). I guess the huge gap between extreme poverty and wealth within the Indian population is certainly the biggest shock for anyone visiting the country and it takes a while to get used to the sight of people living on the streets and children begging for money. 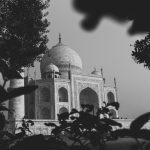 To make up for the long day on Sunday, I had some time in the office on Monday to write my report and recap my experiences of my visit to India. In the afternoon, Anuroop gave me a good overview of all relocation services that IKAN offers and what the exact procedure looks like for each of them. Tuesday might have been one of the most stressful, yet insightful days of my internship. My colleague Rohan took me to Gurgaon to meet some Japanese clients and show them a few apartments. The appointment timings as well as negotiations with the clients seemed very confusing to me because a lot of things were confirmed, changed, confirmed and then changed again. However, I cannot tell whether this confusion can be attributed to the unregulated housing market in India or the different way Japanese clients conduct business. The fact that English was not spoken the whole time made it especially difficult for me to follow what was going on at any given moment. I had experienced that with my colleagues in the office before, but most of the times I did not feel left out because I could still get the whole picture of what they were talking about. All of this confusion during the home finding appointments with the Japanese clients was really exhausting for me, and the 3,5 hours spent in the car on our way to and back from Gurgaon did not help either. Even though I only have to sit in the car and not drive myself, the Indian traffic manages to get me and probably every other German close to having a mental breakdown. I really admire my Indian colleagues for their calmness on the road as there do not seem to be any rules for behaving in traffic whatsoever. And due to the sheer amount of people and numerous kinds of vehicles on the road, there is no way the police could ever control or regulate traffic. After Rohan safely dropped me off at my Delhi home, I sat down with my landlady Shobha and my Brazilian roommate Felipe to watch the news of India attacking a terrorist camp in Pakistan the same morning. What an exciting and unusual day! On Wednesday, Rohit asked Rohan, Rishabh, Anuroop and me to sit down in his office to recap what exactly had happened during the home search with the Japanese clients the day before. It turned out that I was not the only one who was confused by the services and modulations the Japanese clients had asked for. After summarizing the whole process, we concluded that the next step for IKAN would be to send a “wish list” to the realtor and ask what the price would be in order to present the best possible option to our clients. Before noon on Wednesday, the whole situation changed and my stay in India got shortened for about two days unfortunately. As the political situation between India and Pakistan got more and more tense all of a sudden, my boss back home decided to send me home earlier to prevent any issues with my flight. 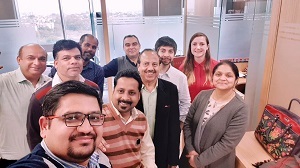 On one hand I was relieved because I did not want to take any chances and risk being stuck at the airport on Friday, but on the other hand I was really sad when I realized that would be my last day with my new colleagues in Delhi. The day went by fast and fortunately the whole company was going out to watch an important cricket game together the same evening, so that served as my farewell party at the same time. I had one great last evening with my new Indian colleagues, who have become my friends in the two weeks that I stayed with them. They showed me their unlimited kindness once again by giving me a vegetarian cookbook for Indian dishes and some other nice presents. I will never forget my time in Delhi and hope to see my Indian friends again sometime, somewhere in the future. About Author – Katrin Krammer is a Global Mobility Coordinator at Palladium Mobility Group, Germany. 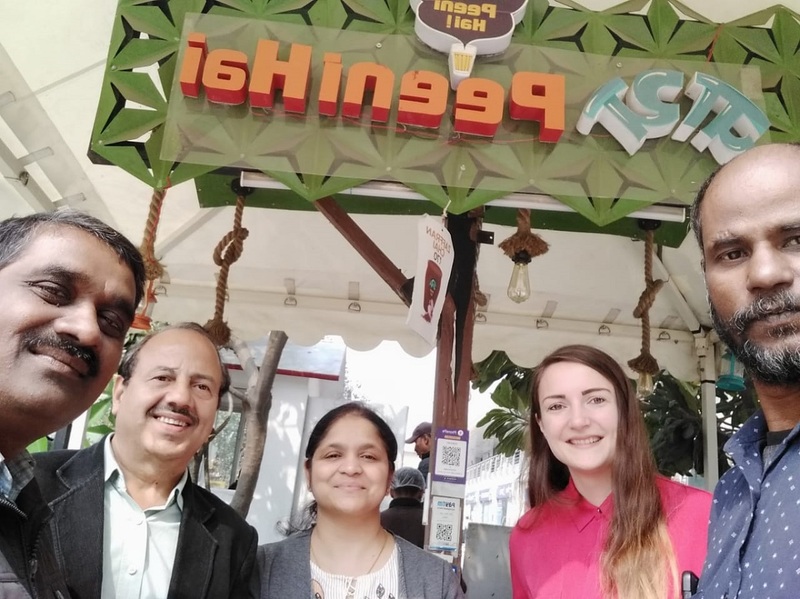 She works at the Palladium Munich office and had a fortunate experience of interning with IKAN Relocation services for two weeks at the IKAN Delhi office. Your Relocation Partner. A Mobility Management company, IKAN Relocations, has been a brand in existence since 1997 . Certainly a great experience for you Katrin and very well documented as well. It was nice meeting you in Delhi and Wish you the Best. Katrin did learn some Hindi that can be seen in this article.. Glad you made friends in just 2 weeks and jelled well amongst each one of us. It was a pleasure meeting you and look forward to seeing and welcoming you again in the near future ! All the very best. Great blog. Enjoyed reading it. 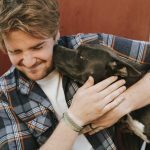 A foreigner’s perspective on how things work in India. 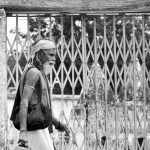 Katrin’s article is like a connoisseurs master piece on Journey through to our Incredible country India. In a short span of time she captured various aspects, moods and vibrant colors of life in the magical city of Delhi and around just like how we term as Aaankho Dekhi. IKAN offers end to end mobility solutions to many blue chip companies on a global, regional and local basis, aiming at supporting the logistics of a global workforce.